Six tablespoons of powdered chocolate, one can of condensed milk, butter. You need three simple ingredients to prepare a Brazilian dessert that’s hard to spell in another language other than Portuguese: Brigadeiro. The name is long, but these are small chocolate balls, covered in granulated chocolate. They are becoming more notorious around the world, disseminated by Brazilians who adore its creamy taste of childhood. Back then, brigadeirosdecorated the table of every birthday party or school celebration, at a time I never dreamed of living on the other side of the Equator. Our suburban expats in NY keep the tradition, running a famous dessert table at the multicultural school fair. Every spring, we all share the cost of ingredients, tie our aprons and stir our national identity in chocolate, until it reaches a specific point of texture in the heat. This texture is never explained in a recipe, it’s just known. It’s part of the Brazilian identity as much as a yellow soccer jersey. Everyone knows it from their own mothers. Except me, who transformed our prized dessert in a national disaster. Years ago, when I started participating in the fair, I was too busy with my youngest child, so I ordered them at a Brazilian store. No shame, how could I find time to roll 200 chocolate balls while breastfeeding? The second year we decided to make it together at a friend’s house. She loved to cook the mixture and hated to roll the chocolate balls and dip them in granulate. 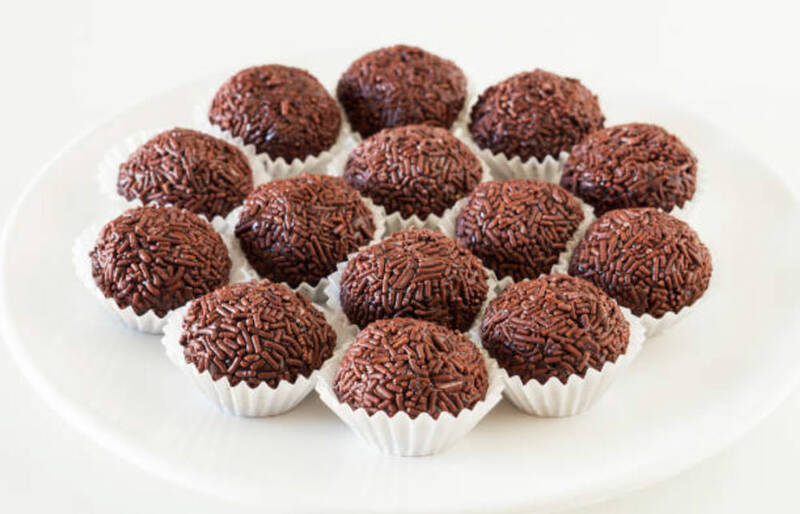 I rolled 400 brigadeiros in three hours, chatting and drinking coffee at her kitchen table, while she stood up by the stove and cooked countless pounds of the mixture. A few months ago, I had to face another multicultural lunch at my son’s school on my own. The task: 150 brigadeiros. I was nervous. I had never cooked them by myself. My mom was never the best chef and when everyone was proud of their own adventures in the kitchen, she had a blue notebook with all the addresses for home delivery. She assured me I would be OK: “I’m sure you have brigadeiro timer in your DNA”. I felt as a genetic mutation when the mixture unfolded, the consistency didn’t change and it started to burn. When almost a third of the mix was glued to the pan as hard as caramel and as black as asphalt, I decided to pour it onto a large plate. It was not. Every time I tried to roll the little balls, they stuck to my fingers, as condensed milk would do. When I could make a funny shaped ball and drop it in the granulated chocolate, it splashed flat on the plate. I started to sweat and get nervous, walking from the table to the sink and vice versa, washing my sticky hands after rolling every single one. I had no more ingredients and no more time to try again. I rolled only 70 balls using the granulate chocolate as unifying agent. They tasted horrible, they were too sweet and were melting as soon as I placed them in the paper cups. Imagine a raw cupcake being served, the batter falling from the sides of the cups. That was more or less the same, just a smaller cup and a chocolate mixture. Disgusting. I came to the lunch with my shameful tray covered in foil, mortified and angry. There were other six proud Brazilian women in our booth. I apologized and hid the covered tray under the table, amidst all the other perfect brigadeiros that real Brazilians had produced in their homes. I told them my horror kitchen story. They all sympathized and said “Kids won’t know the difference”. I helped to pass and uncover trays with perfect round chocolate truffles, their diameter the size of a quarter coin. When my tray was uncovered there was no need to say whose brigadeirosthose were. The ladies were polite and said nothing. When my turn ended, I passed the Irish booth on my way to the exit door. The Gaelic moms offered large portions of shepherd’s pie that smelled like a winter dinner by the fire. I am married to an Irishman for 20 years and my shepherd’s pie is prized as one of the best in the neighborhood. As I crossed the schoolyard and saw kids having their feast, the whole world contained in their paper plates – samosas, spring rolls, lasagna, waffles, and cupcakes – I made a mental note to myself. I shall contact the Irish squad next year, just in case.